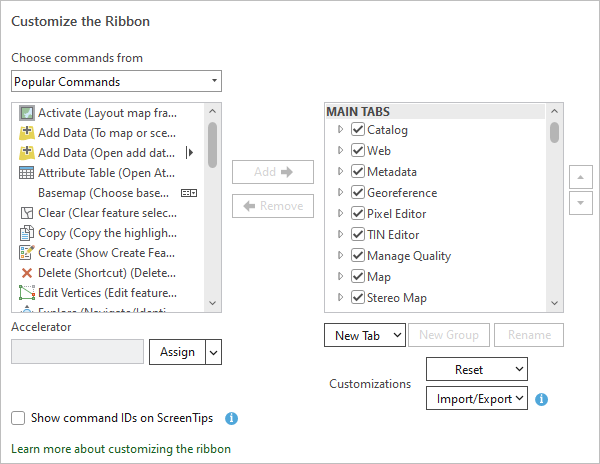 You can customize the ArcGIS Pro ribbon by creating new tabs and choosing which commands appear on them. You can also add new groups and commands to existing tabs. On the Options dialog box menu, under Application, click Customize the Ribbon. You can organize functionality for your convenience by adding commands to new groups on existing ribbon tabs or new tabs. At any time, you can remove specific customizations or reset the ribbon to its default state. The Choose commands from drop-down list. Commands that you want to add to new groups can be selected from their current locations on the ribbon (List of Tabs) or from an alphabetical list (All Commands). Geoprocessing tools are found on their own list (Geoprocessing Tools). By default, commands are presented in the left-hand window in the List of Tabs format. To access a command, expand the tabs and groups on which it is found and then select the command. The current configuration of the ribbon is presented in the right-hand window. This is where new groups and new tabs are added. Buttons to add and remove commands. Buttons to add new tabs and groups, and to rename tabs and groups. Drop-down menu choices to reset customizations. Button to assign accelerators (keyboard shortcuts) to commands. Check box to show command IDs. The most common way to customize the ribbon is to add commands to a new group on an existing tab. Open the Customize the Ribbon options as described above. In the scrolling window on the right, representing the current ribbon configuration, browse to the tab that you want to add a group to. Select the tab. 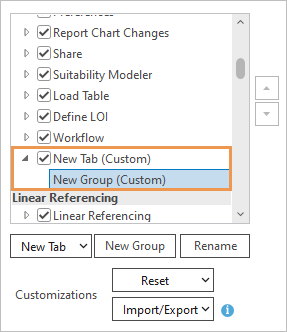 Optionally, expand the tab to see its groups. 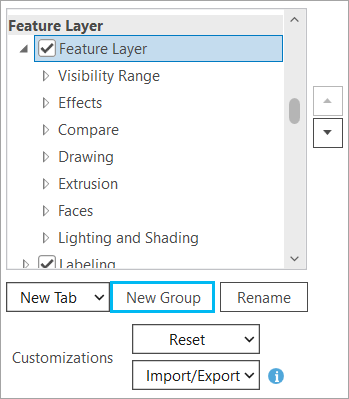 In this example, the Appearance tab on the contextual Feature Layer tab group is selected. A new group is added under the other groups on the tab. Its default name is New Group. With New Group selected, click Rename. On the Rename dialog box, replace the display name with a name you want. Click OK. In the Choose commands from drop-down list, accept the List of Tabs setting. Alternatively, click the drop-down arrow and choose All Commands or Geoprocessing Tools. If you choose All Commands or Geoprocessing Tools, a search box becomes available to help you find commands. In the scrolling window of commands, browse to, or search for, the command you want to add. Widen the Options dialog box to see the full command names. Select a command and click Add. 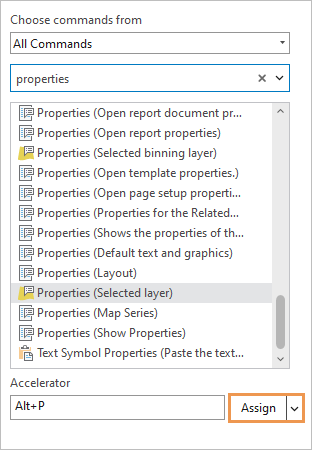 In this example, the command to open layer properties is added to a new group named Properties. If you add more than one command to a group, you can change the display order of commands with the arrow buttons on the right side of the dialog box. Return to your project or open a project. Select the tab you added the new group to. The group and its commands appear on the tab. In this example, layer properties can be opened from the contextual Appearance tab. 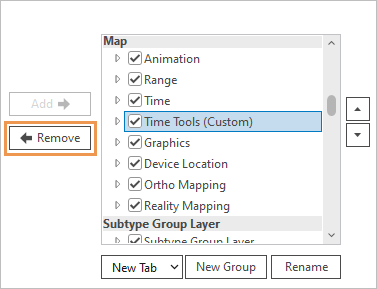 You can add a new tab to the ribbon to organize commands that are not grouped on the ArcGIS Pro interface by default. Open the Customize the Ribbon options. Under the scrolling window on the right (the current ribbon configuration), click New Tab. In the window, a new tab and new group are added under the other core tabs, above the first contextual tab group. On the ribbon, the new tab will appear to the right of other core tabs. You can place a new tab in a different position by selecting an existing tab before adding the new tab. However, this is not recommended because the new tab may not appear in the expected position in all contexts. New tabs cannot be added to contextual tab groups. With the new tab selected, click Rename. On the Rename dialog box, replace the default name with the name you want. Click OK. Under the new tab, click New Group to select it. Rename the new group. Select the new tab. Add new groups as needed and rename them. When you're finished, select a group to add commands to. In the Choose commands from drop-down list, accept the List of Tabs setting or click the drop-down arrow and make a different choice. In the scrolling window of commands, browse to, or search for, a command. Select the command and click Add. In the same way, add more commands to the group, and add commands to other groups on the tab. When you're finished, click OK.
Return to your project or open a project to see the customization. A new tab named Convert is added to the ribbon. You can remove your customizations as needed. You may want to remove a command that you added to a new group. You may want to remove a group that you added to an existing tab or to a new tab. Or you may want to remove a new tab that you added. In the scrolling window on the right (the current ribbon configuration), browse to and select a command, group, or tab that you added. In this example, a command is removed from a group. Removing a group removes all its commands. Removing a tab removes all its groups. 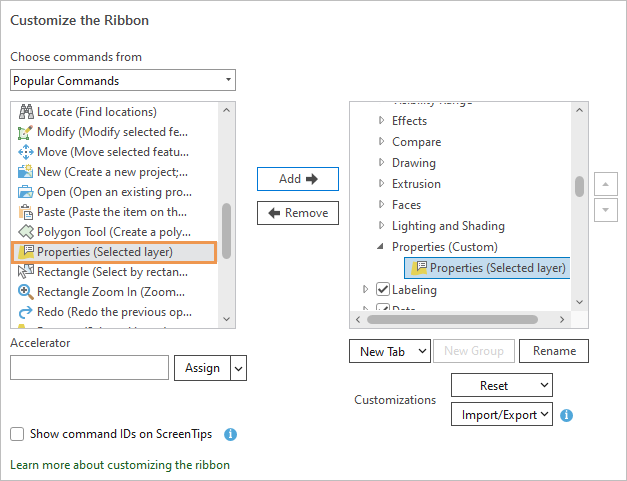 Use the Reset button to remove all customizations from a selected tab or to remove all customizations from the ribbon. In the scrolling window on the right (the current ribbon configuration), browse to a customized tab and select it. Next to Customizations, click the Reset drop-down arrow and click Reset Selected Item. 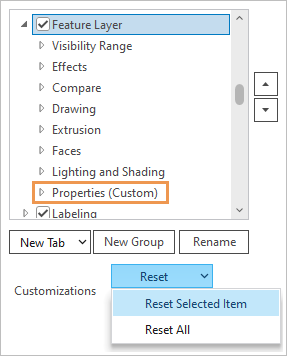 In this example, the custom Properties group will be removed from the Appearance tab. If there were other custom groups on the tab, they would also be removed. All customizations of the selected tab are removed and the tab is restored to its default configuration. Customizations to other tabs are not affected. To remove all customizations from the ribbon, click Reset All. This restores the ribbon to its default configuration. You can use keyboard accelerators, also called keyboard shortcuts, to execute a command with a keystroke combination or function key. You may want to add keyboard accelerators to commands you use frequently. In the scrolling window on the left (the list of commands), browse to, or search for, a command and select it. Under Accelerator, type a keystroke combination and click Assign. In this example, the accelerator Alt+L is assigned to the command that opens layer properties. Return to your project or open a new project to use the accelerator. The accelerator only works in appropriate contexts. For example, an accelerator that opens layer properties only works if a map view is active and a layer is selected in the Contents pane. 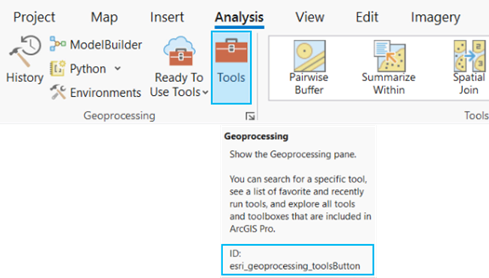 If you enter a keystroke combination that is already assigned to another command (either an ArcGIS Pro default or an accelerator that you added), a message will appear and identify the command the accelerator is currently assigned to. You can choose whether to override the assignment. You may want to remove an accelerator if you don't use it. In the scrolling window of commands on the left, select a command that has an accelerator assigned to it. If a command has an accelerator, the keystroke combination appears in the Accelerator box when the command is selected. Otherwise, the box is empty. Click the Assign drop-down arrow and click Reset. The accelerator is removed from the Accelerator box. To remove all custom accelerators, click the Assign drop-down arrow and click Reset All Accelerators. ArcGIS Pro default accelerators are not affected. Every command has a unique text ID, which is used by add-in developers to find or call commands. For easy reference, the command ID can be displayed in the command's ScreenTip on the ribbon. Check the Show command IDs on ScreenTips check box. Return to your project or open a project. Hover over a command on the ribbon to display its ScreenTip. To stop displaying command IDs, uncheck the Show command IDs on ScreenTips check box in the Customize the Ribbon options. You can also get the command ID by browsing to a command in either scrolling window, right-clicking the command, and clicking Copy ID to clipboard.